Troubleshoot and validate high-speed designs now and into the future with upgradeable bandwidth from 1 GHz up to 8 GHz. Get accurate measurements with low noise, 12-bit analog-to-digital converters, and 25 GS/s sample rate per channel, which does not drop as you turn on channels. See what engineers are saying. 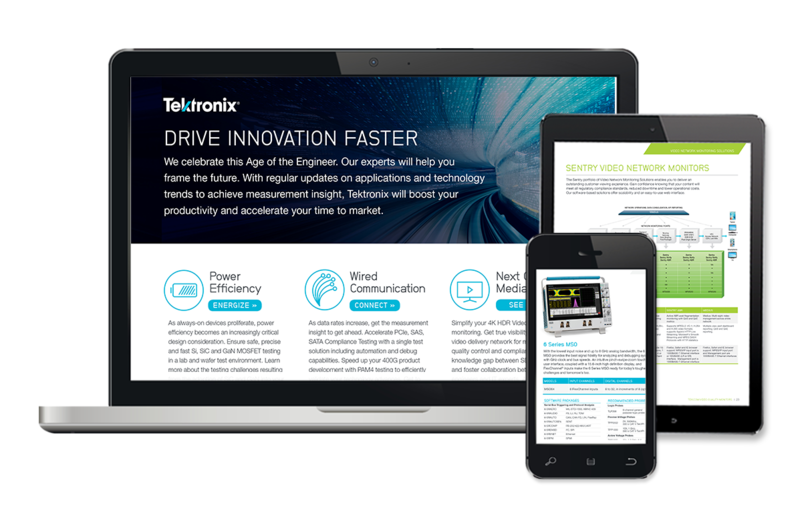 Tektronix PRISM media analysis platform offers the single solution for Engineering and Operations. The base unit is provided with a broad range of connectivity solutions enabled for both SDI and multiple IP standards to address the needs of Production and Editing but can be easily scaled up to address high end Technical QC and Engineering. Upgrade your most important measurement instrument to get more measurement functions and wider measurement ranges for current and resistance. The RSA500A series offers rugged, portable real time spectrum analysis for interference hunting, spectrum management, network maintenance tasks and pre-compliance EMI/EMC testing. The rack space-saving Model 2606B packs four 20-watt SMU channels into a single 1U form factor chassis. It offers the capabilities of a precision power supply, true current source, 6½-digit DMM, arbitrary waveform generator, and pulse generator into one tightly integrated instrument. The cleanest signal on the market at an unbeatable price per channel. With code compatibility you can fast forward integration and scaling. Test and validate sensitive devices that require lots of inputs at a low cost without sacrificing performance. Delivers better RF performance on key parameters like dynamic range, and includes a built-in Bias Tee. Whether you’re designing for RF devices or teaching in the lab, the TTR500 Series VNA gives you all the capability and performance you need in a 6 GHz 2-port VNA at a price you can afford.